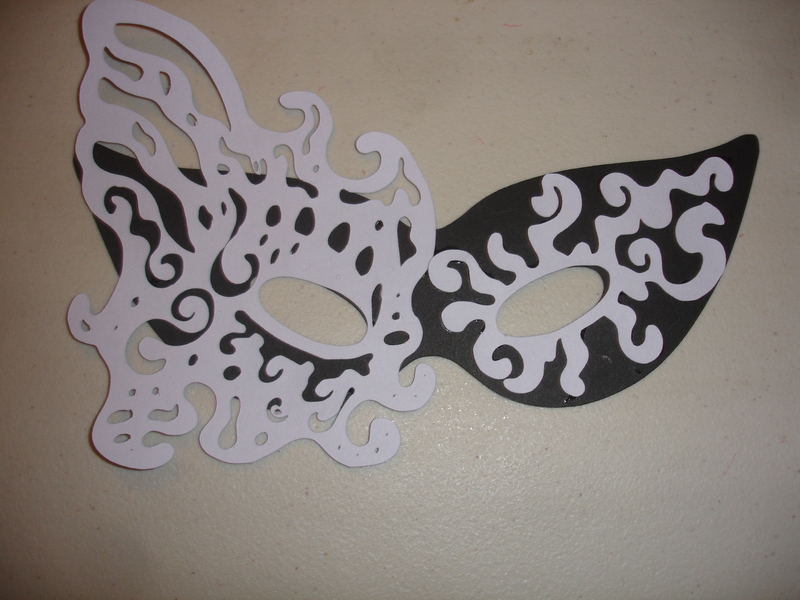 Today I am going to share some photos of my newest invitation I recently made. They turned out so dang cute. 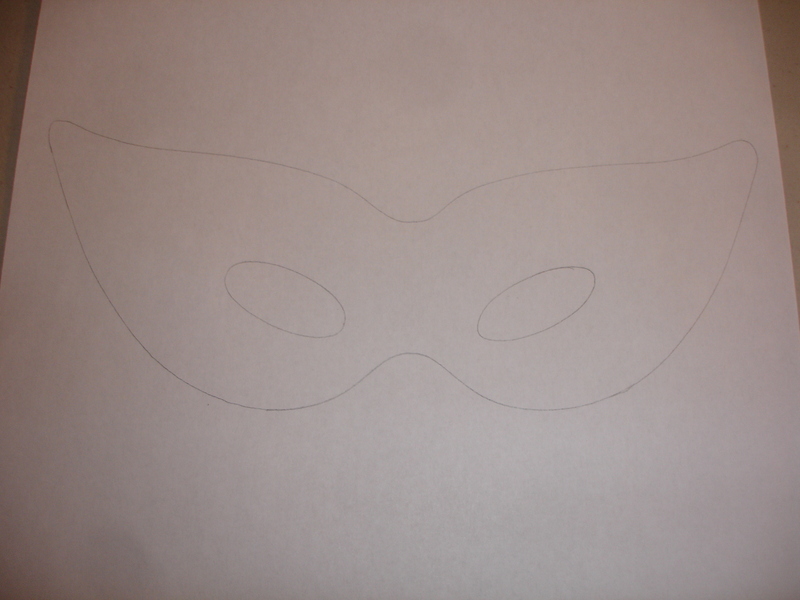 So start off with a basic mask shape and cut it out. 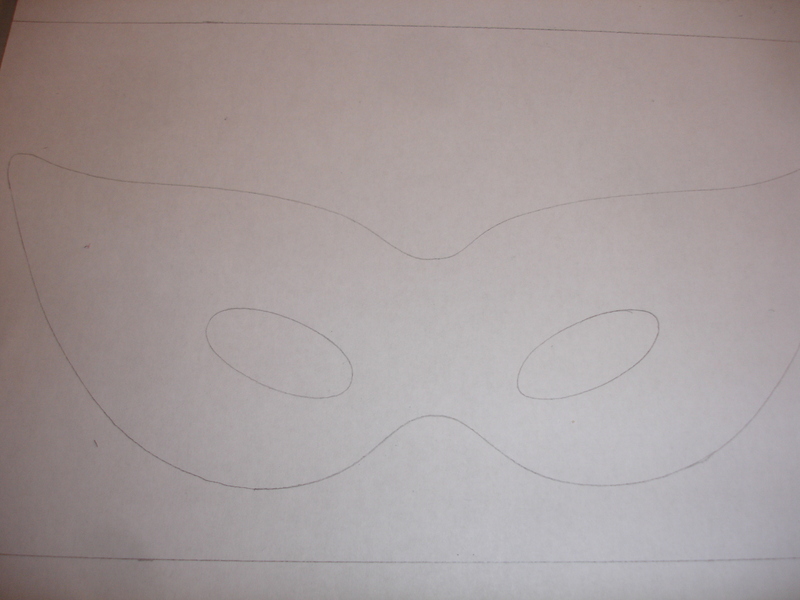 Once I had the base mask, I then traced it onto a piece of copy paper. Now because I wanted to make sure they fit the envelopes I have for them. 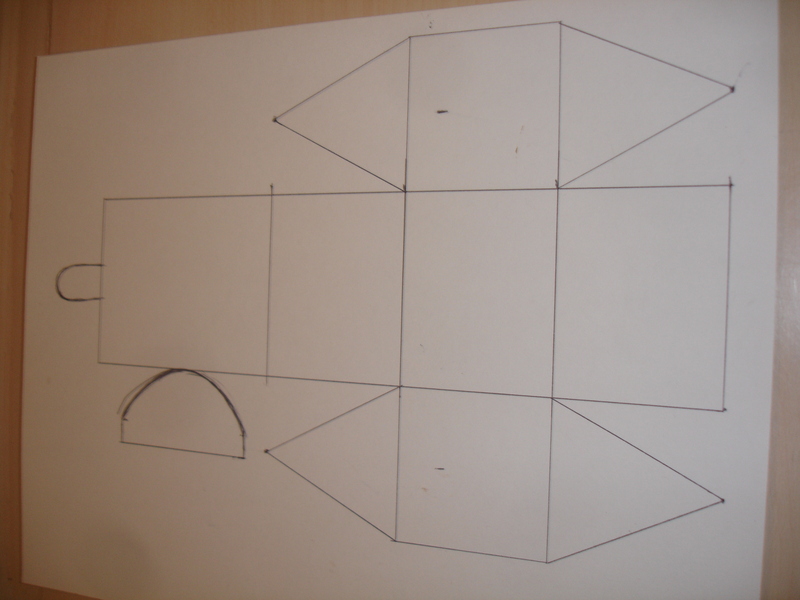 I took measurements and then drew a box around the mask so that I would know how much room I had to work with. 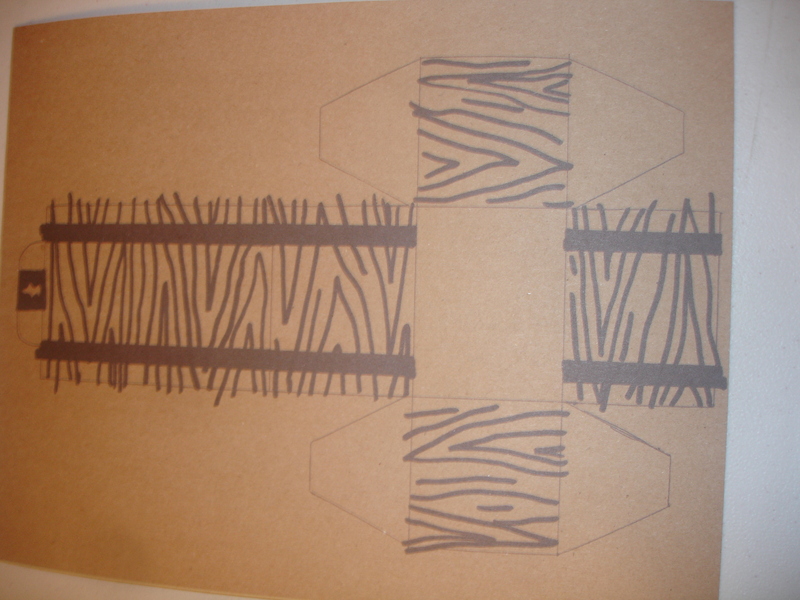 Here is the fun part, the design. I first drew it out in pencil. 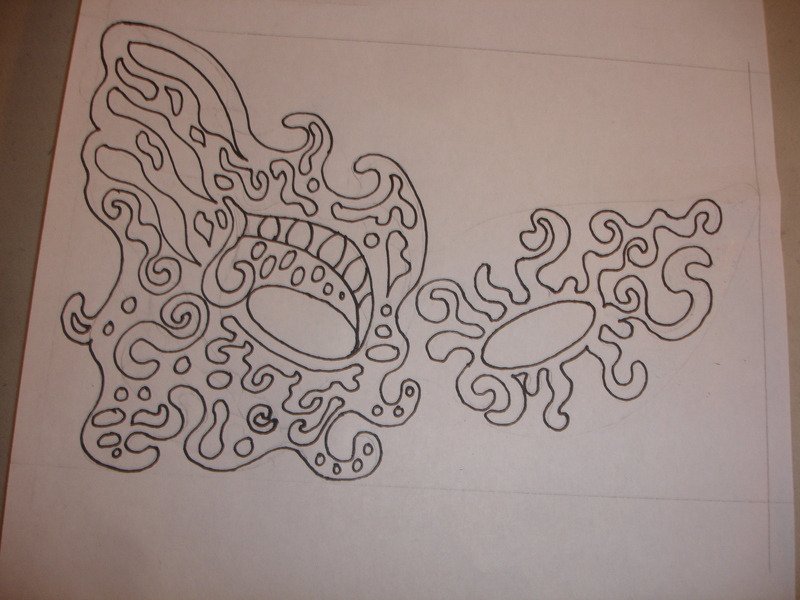 Then when I was happy with the design I drew it in with a black marker. 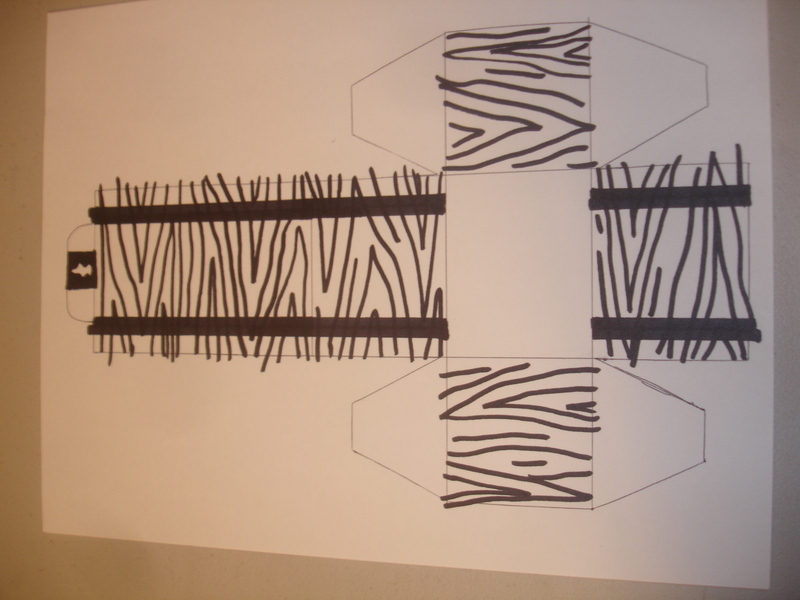 Once the drawing was complete I created a die cut for it and started cutting them out. 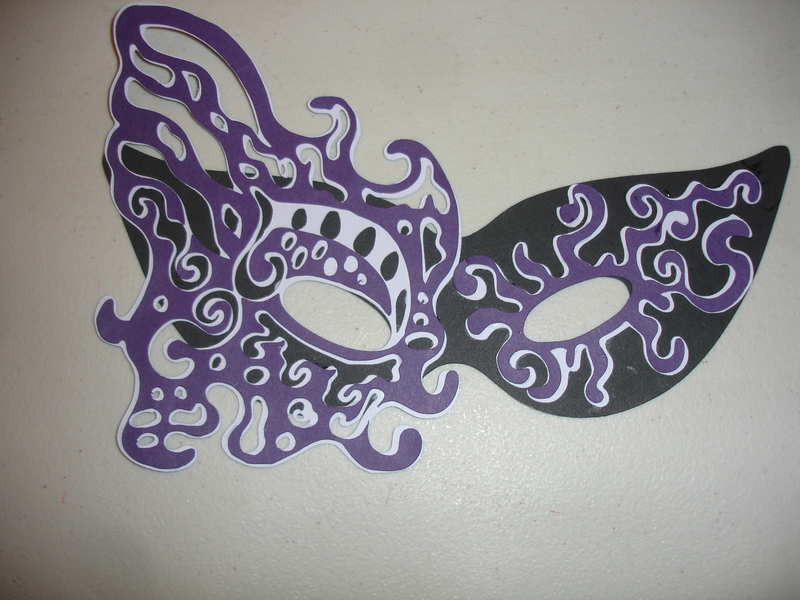 This mask had 2 layers of color. 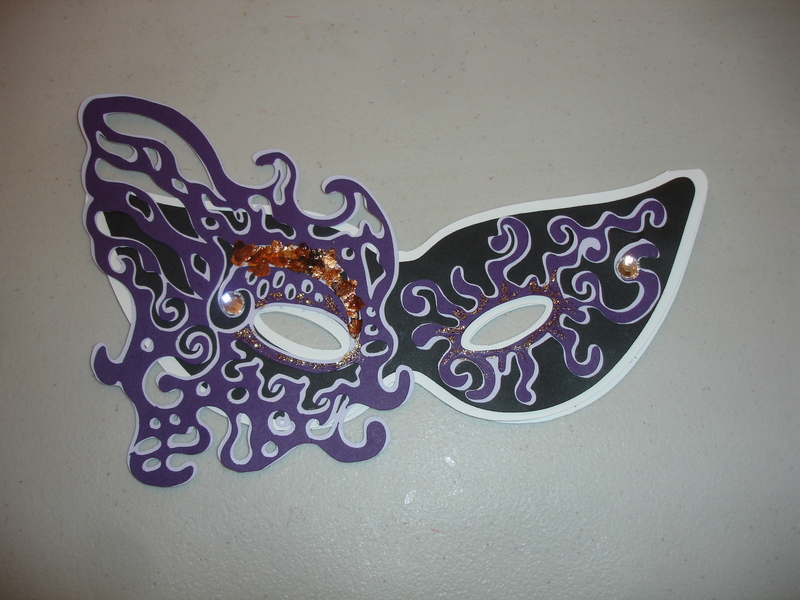 the first layer (which was done in lavender) was laid onto the base mask. 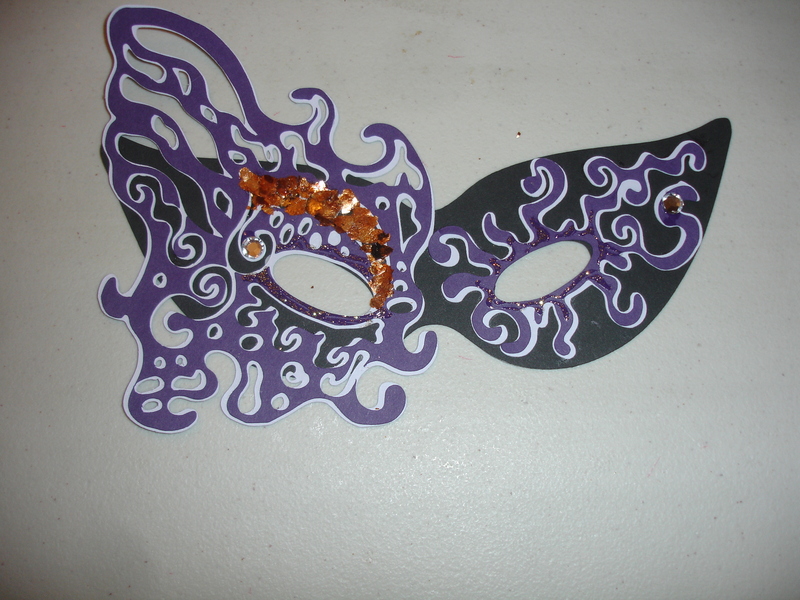 Then the 2nd layer (which was done in a dark purple) was layered on next. Now you can go crazy or keep it simple. I took gold glitter glue around the eyes. (i know it’s hard to see this step), then added bronzed mica fragments over the right eye (this is made by stampendous) and last but not least added two rhinestones, one on each side. Ok it wouldn’t be a real invite without a place to put all your info. 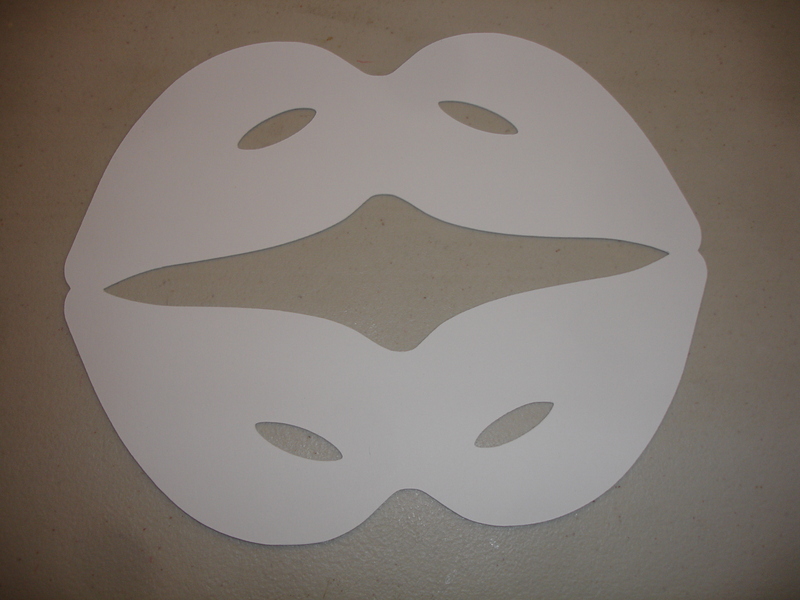 So I cut out yet another piece which mirrored the base mask but bigger. 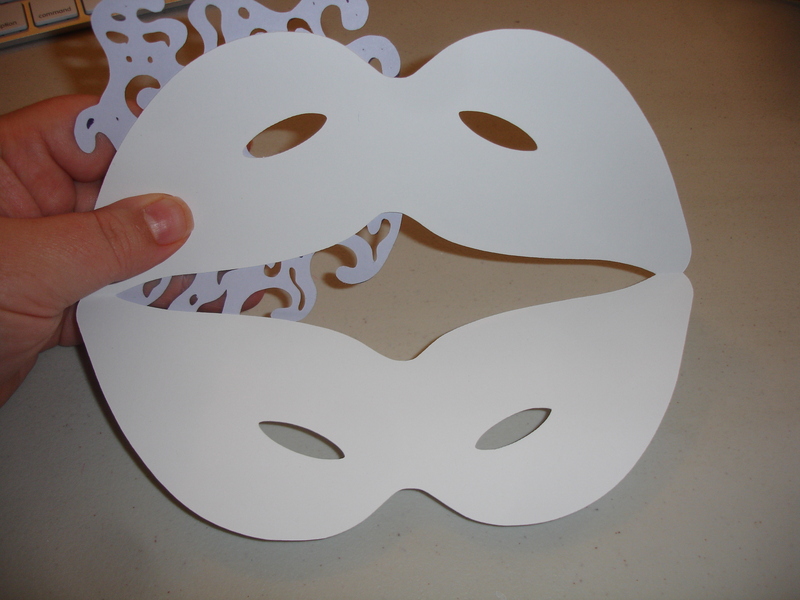 Glue your mask onto the white piece and fold over. You can now add your info to the inside. 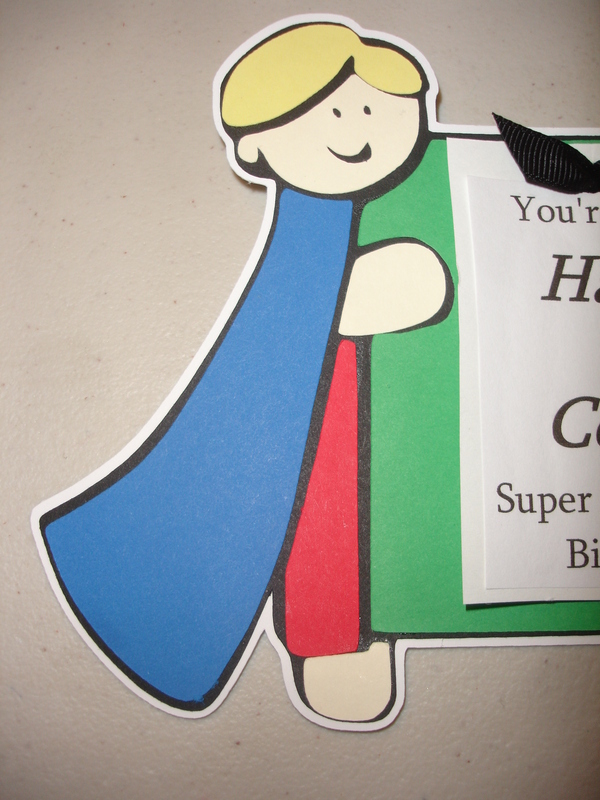 Here is a shot of the final invitation. Isn’t it just lovely. I have had so much fun working on this one. 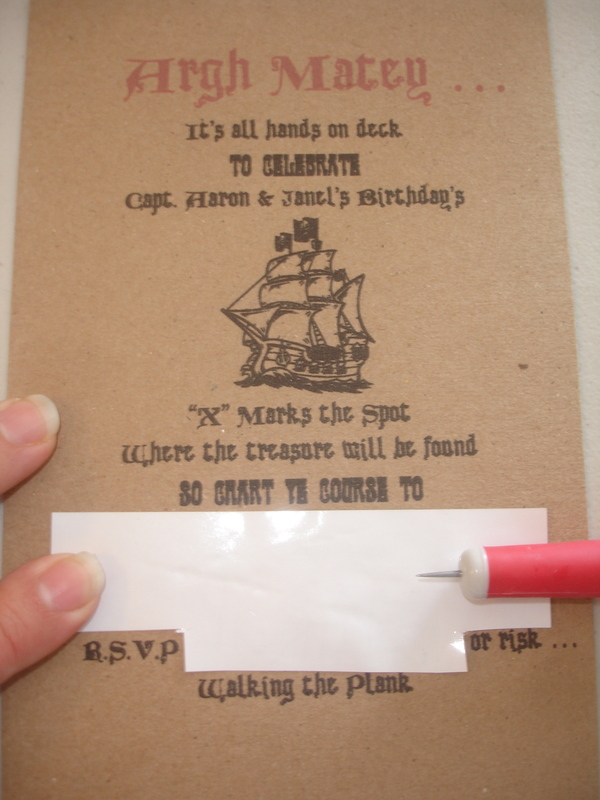 So I was given the challenge to make and design an invite for a combined birthday party. the little boy wants super hero stuff and of course the little girl wanted princess’s. So after thinking about this one for awhile, I came up with this cute design. 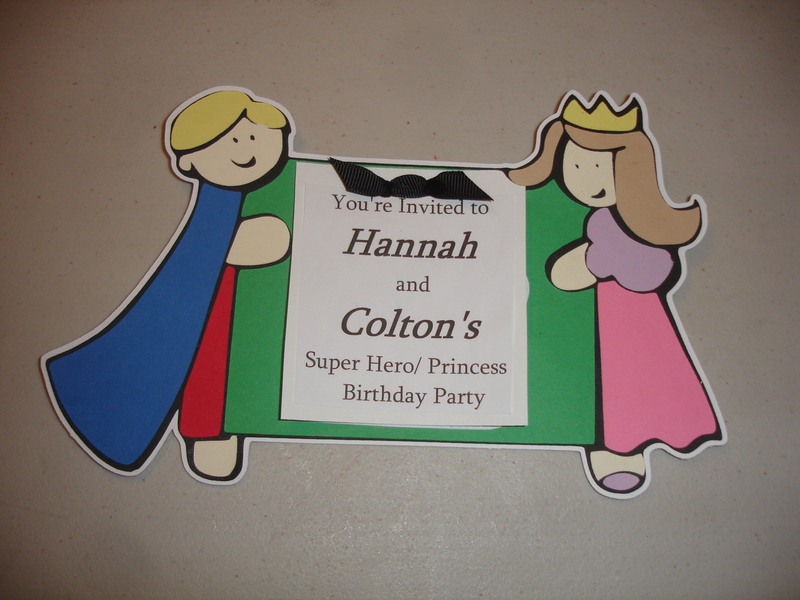 A little superhero on one side and a princess on the other side of the invite holding the card. 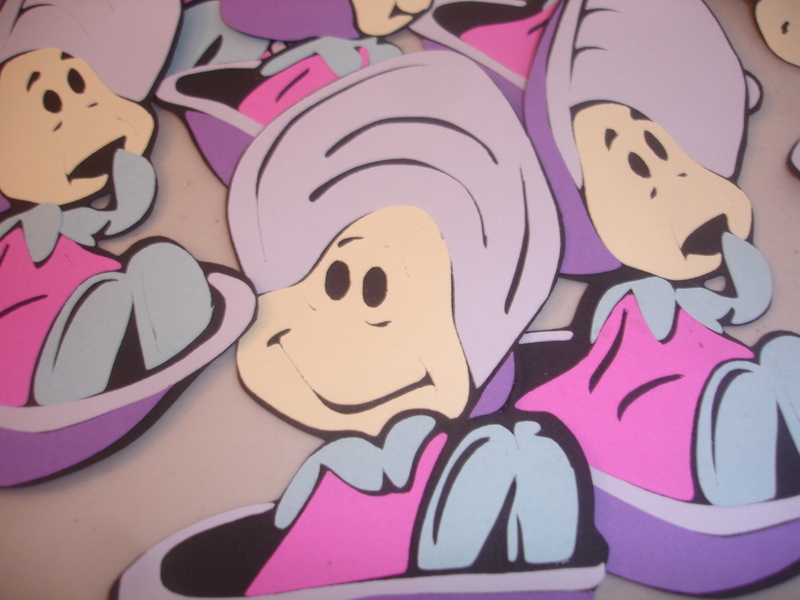 and what’s great is that I could change the hair color or skin color to match the birthday kids. 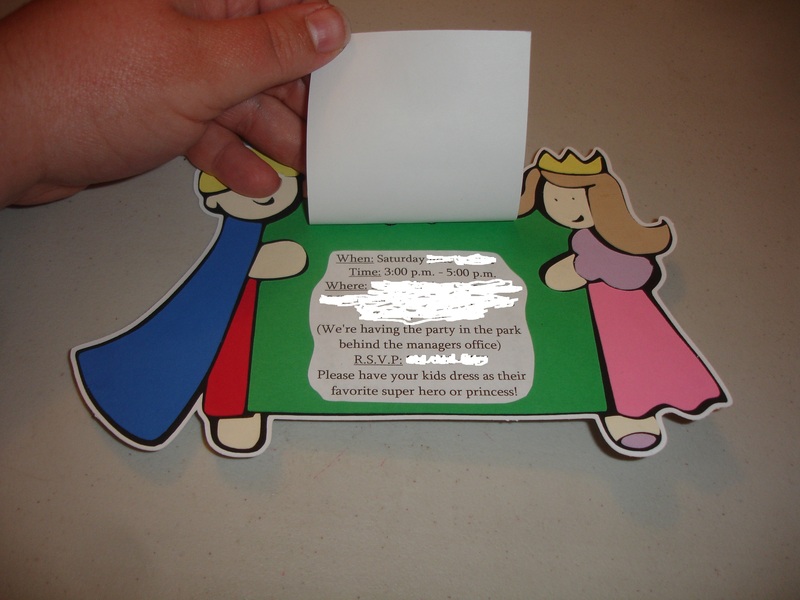 On this one you flip up the top card to reveal more party information. 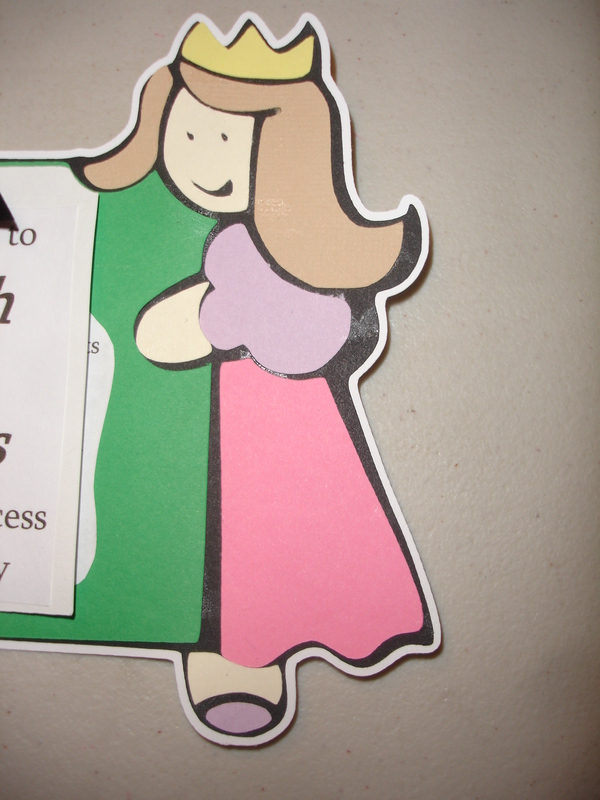 Once I printed out all of my invites onto recycled brown card stock. 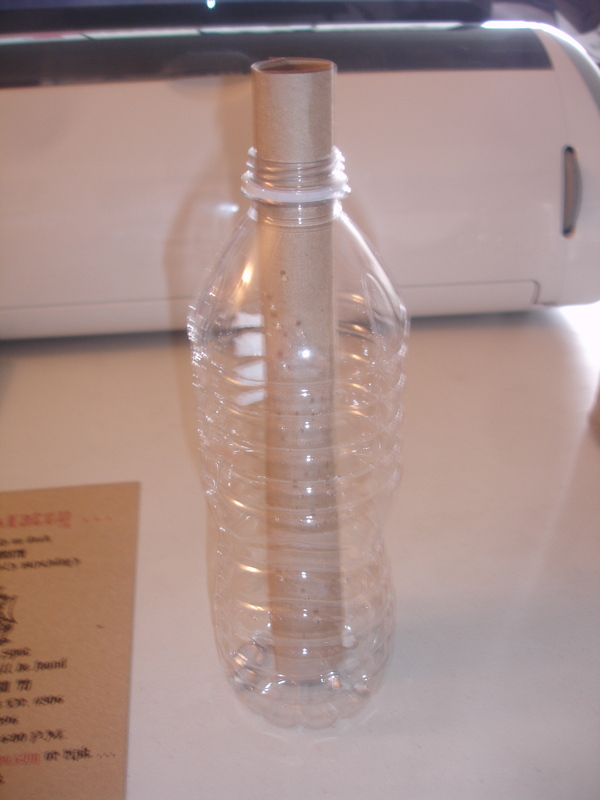 I rolled one up and inserted into a empty water bottle. 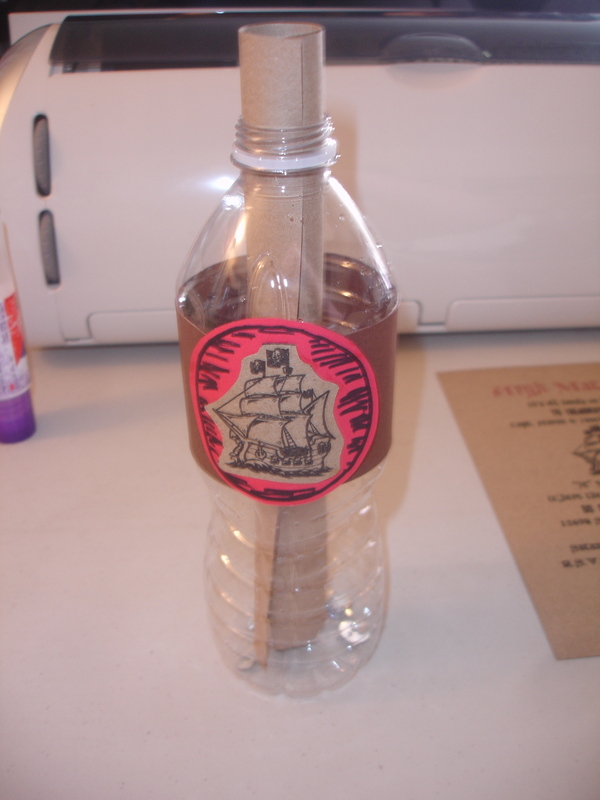 I also added some jewels in the bottom of the bottle instead of sand. 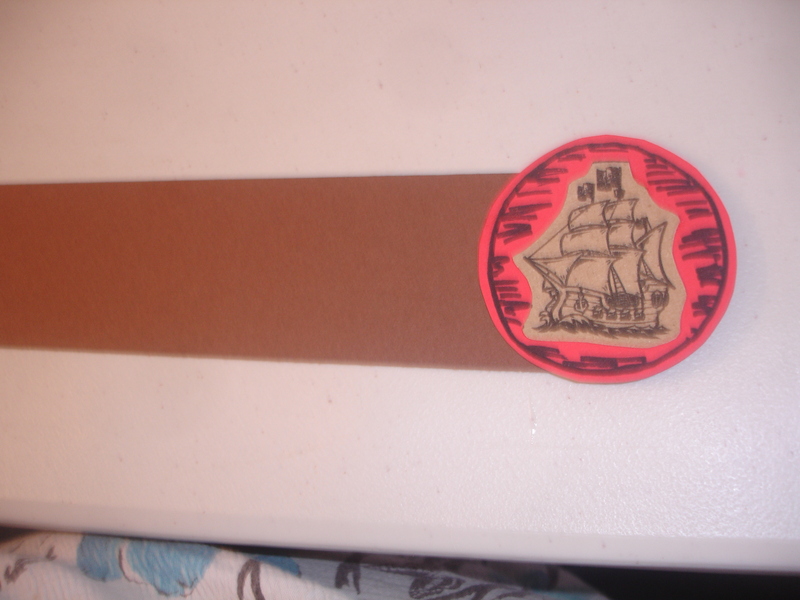 now to make a label. take one 2 1/2 round circle, a design (I chose to use the same ship image as on the invite) and a 2 x 8 1/2 in strip of paper. 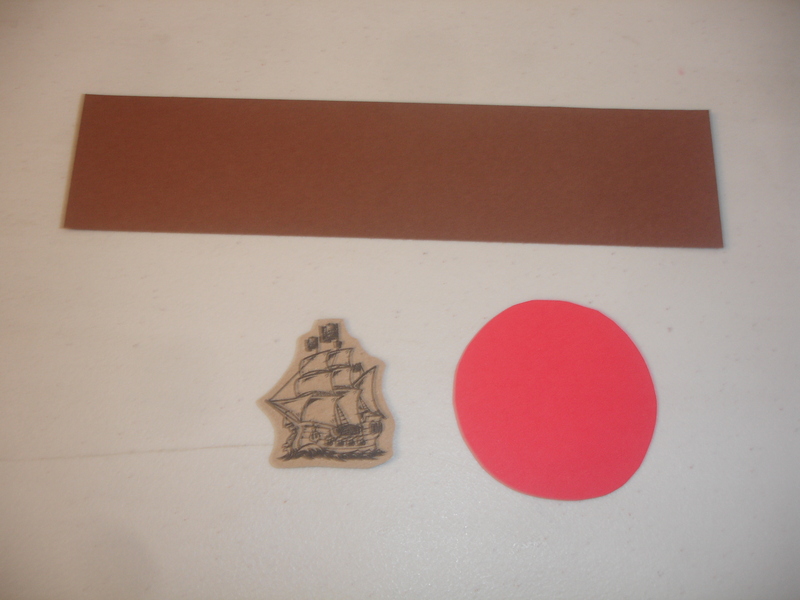 cut out the image (ship) and glue it onto the circle. 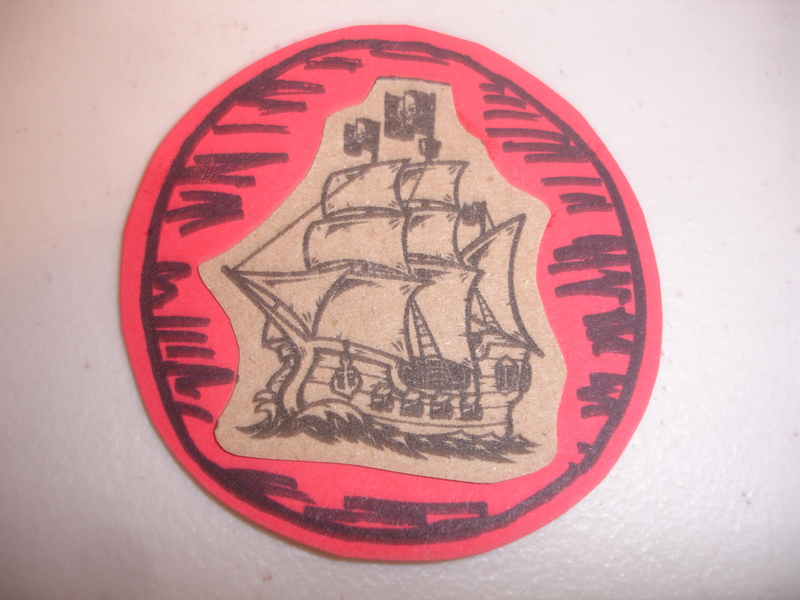 I then took a black marker and drew a circle on the circle and added marks. 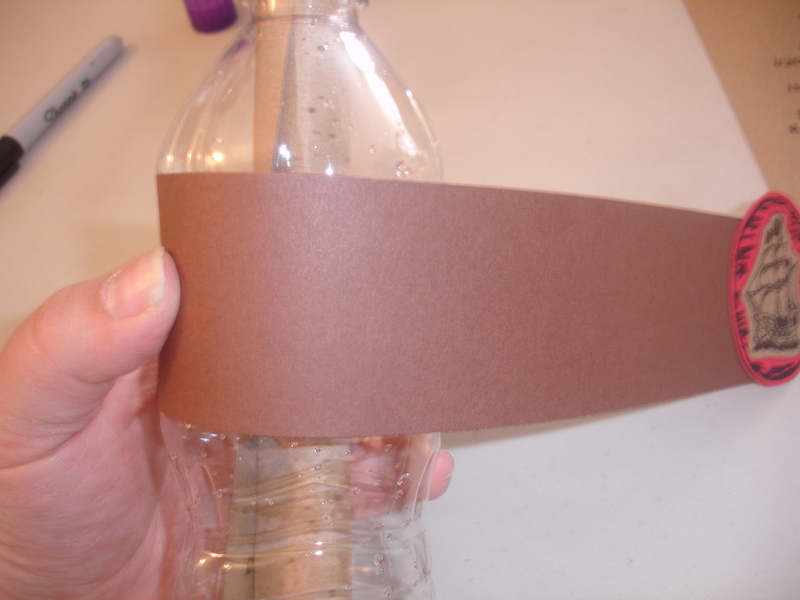 Attach your circle to the end of the strip of paper. 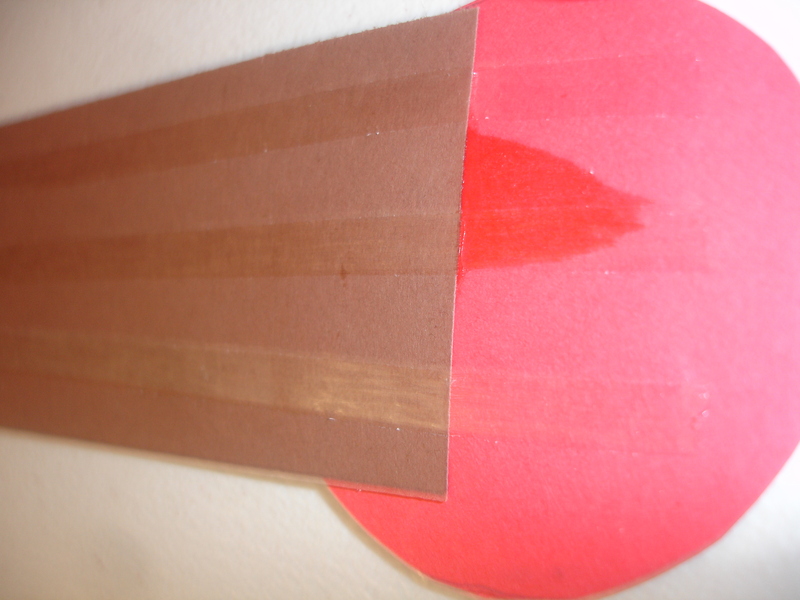 then i used my Scotch Advanced Tape Glider and applied 3 lines down the back of the strip continuing onto the circle. here is a closer look at that process. 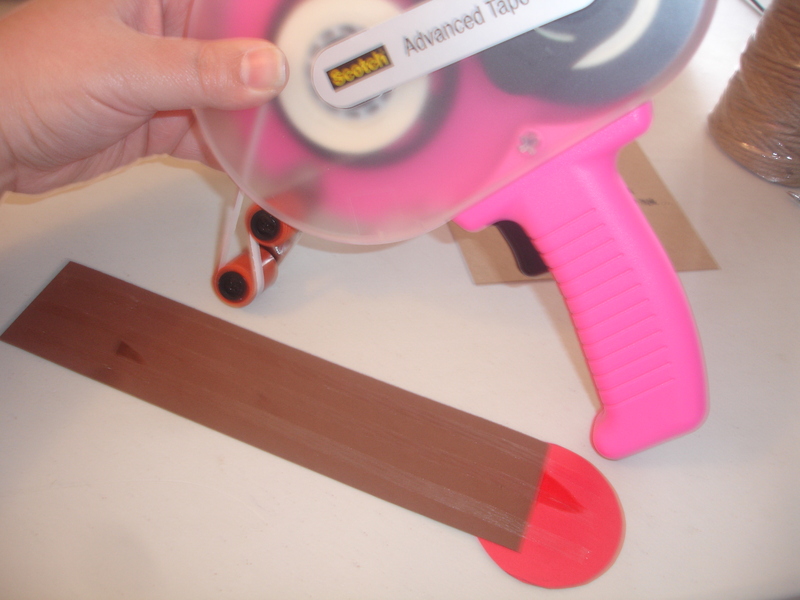 Now grab your bottle and starting on one side, apply the strip all the way around the bottle until the 2 ends connect. 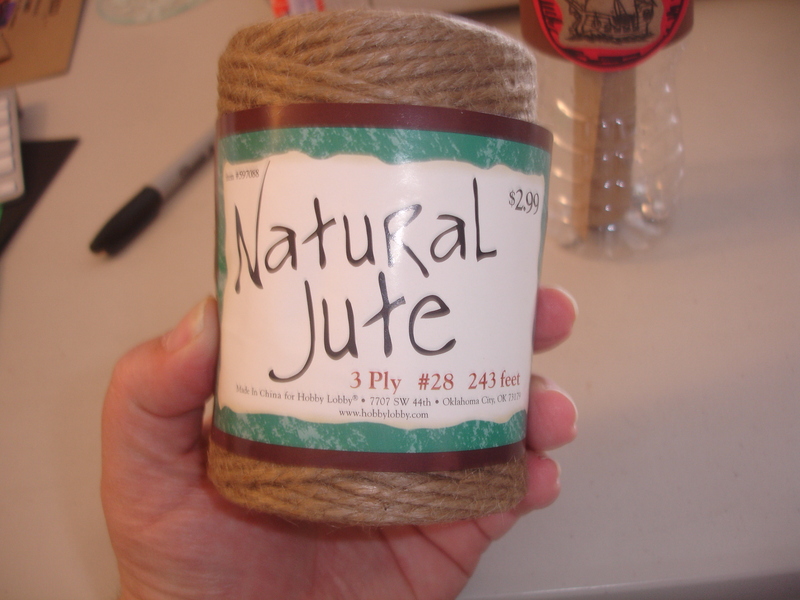 I used Natural Jute;s 3 ply brown twine to the top of the bottle to finish her off. Here you go. 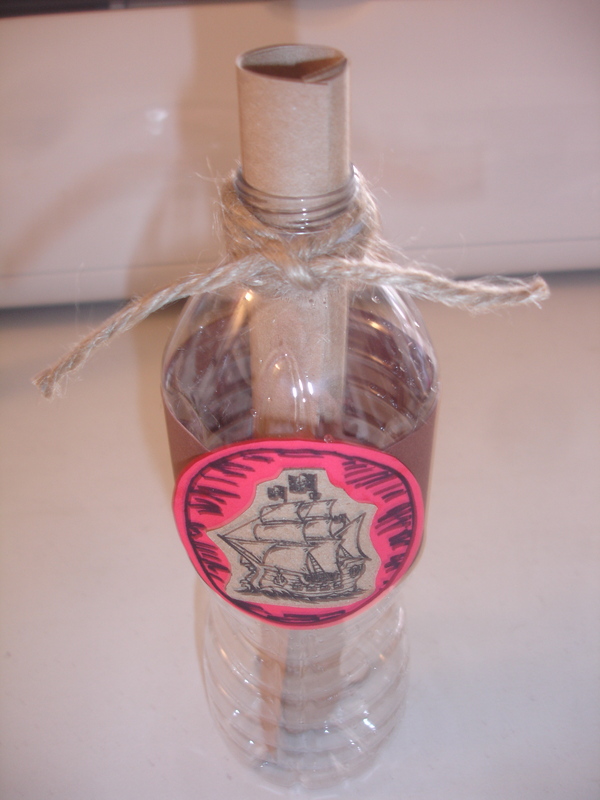 a finished pirate invitation in a bottle. it took me a little tweaking to get it right.. here are a few examples. 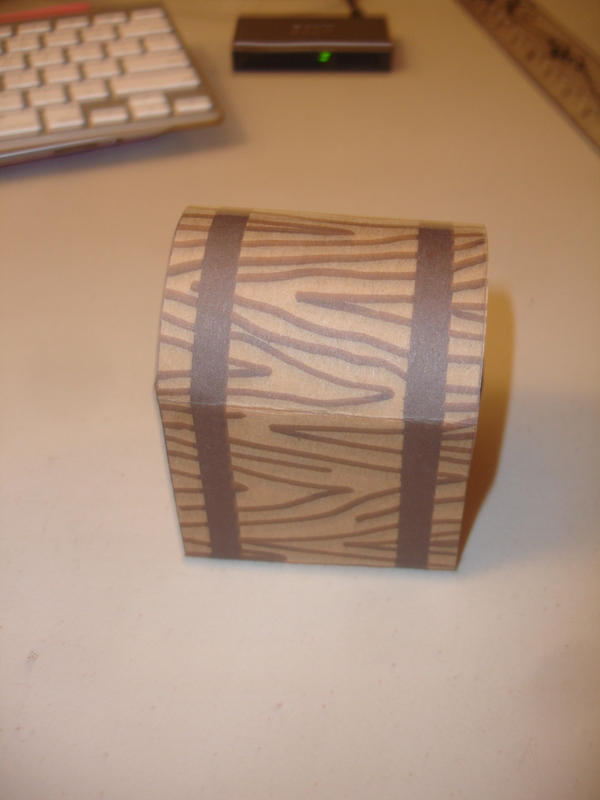 here is the final pattern and I added wood grain to the sides that would show. 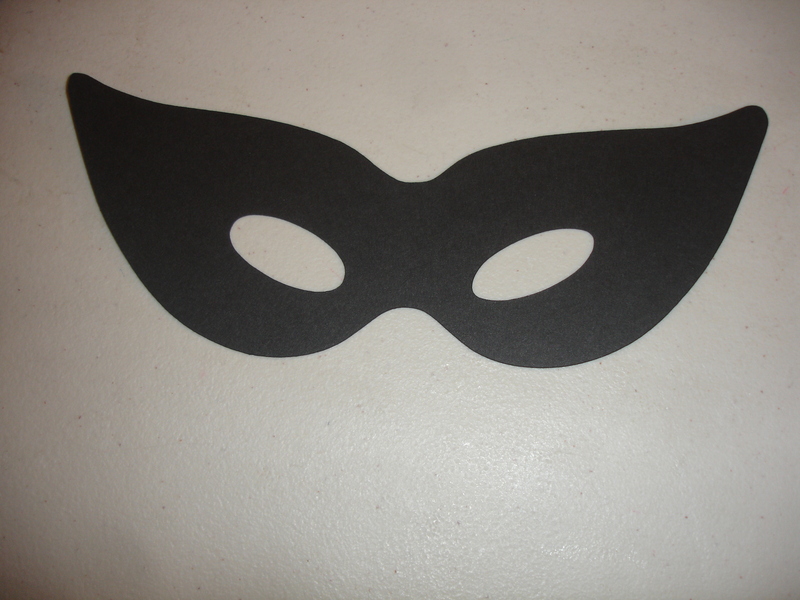 then I plunked it down on my copy machine, put in some light brown card stock and printed the bad boy out. 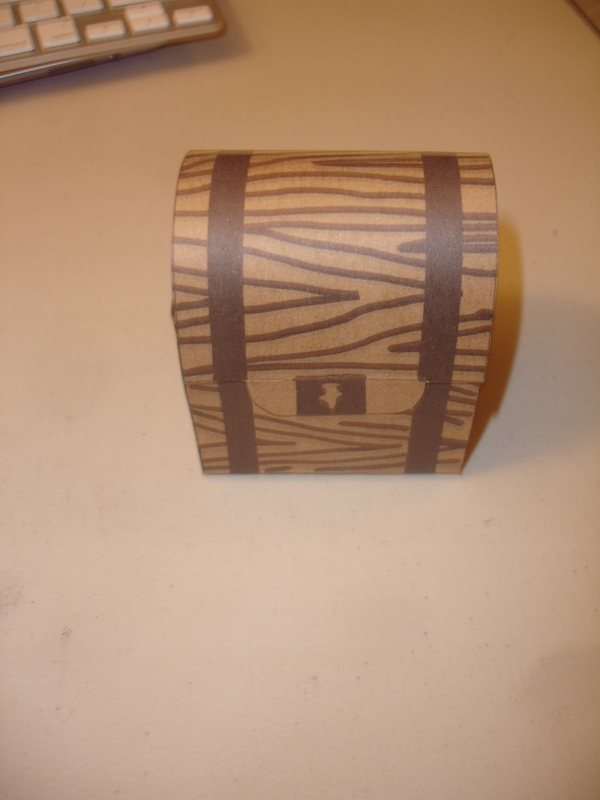 I can’t wait to fill it with goodies and bling it out with some jewels. 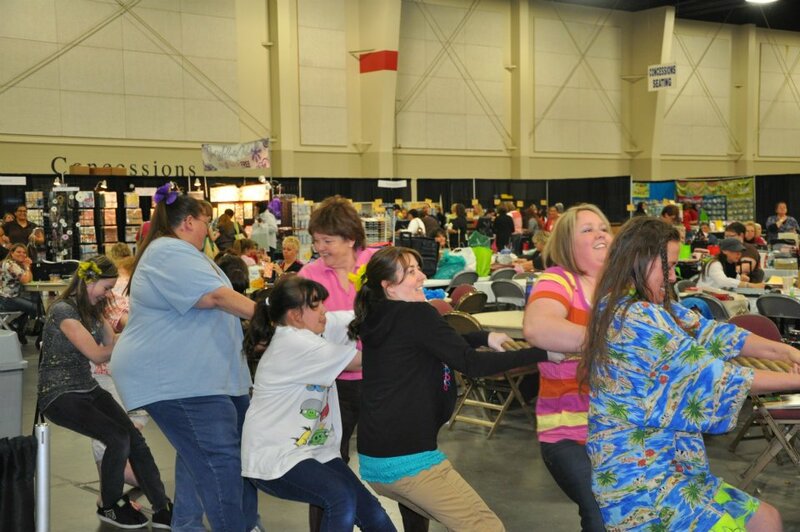 During the scrapbookusaexpo 2012 me and my sister chose to experience there VIP seat treatment. 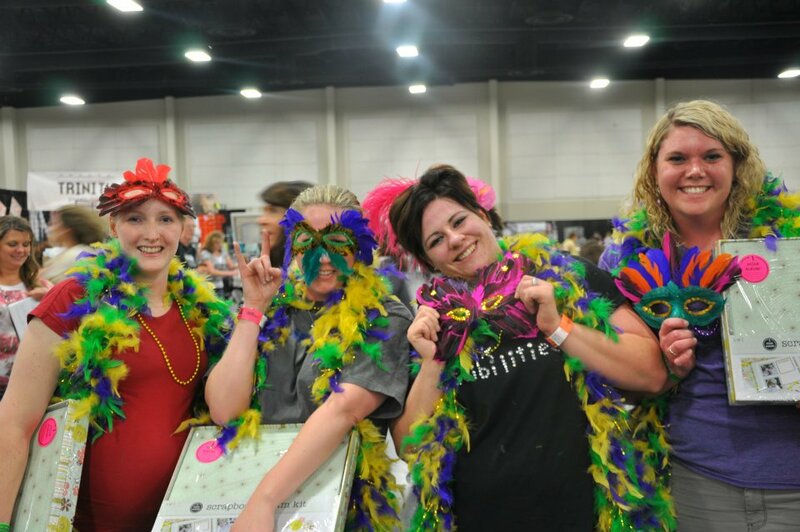 this entailed us receiving early entry (even before the early bird shoppers), a free cricut apron, seating in the exclusive VIP area, a make and take class, treats, a VIP host and an opportunity to enter into a layout page contest. the contest: there were about 5-6 prizes to be rewards. 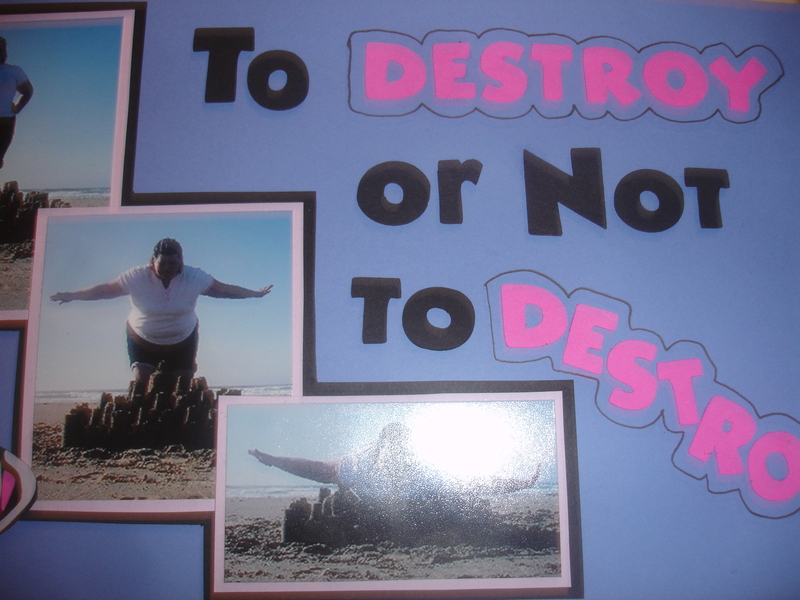 The terms for entering was to submit a summer type scrapbook layout for judging. 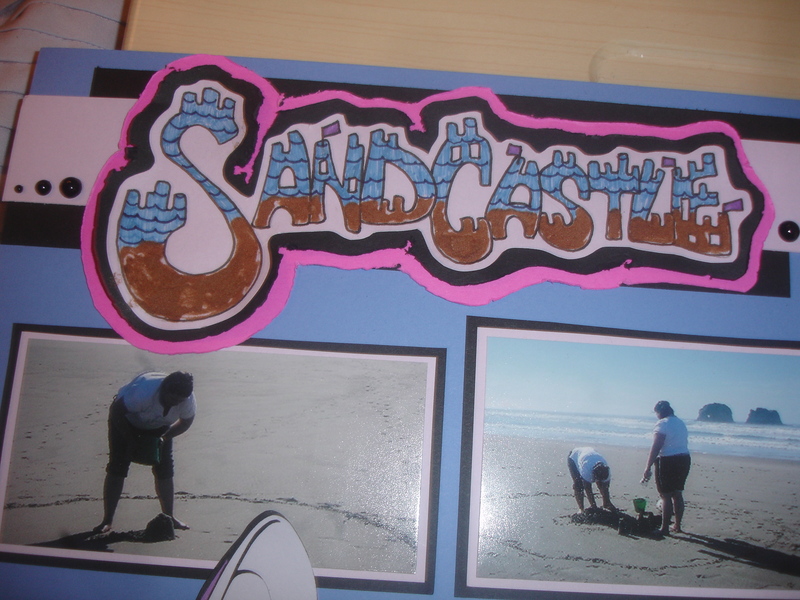 Here is my hand drawn sandcastle title. After I sketched it out with a pencil, I took my black marker and outlined it. 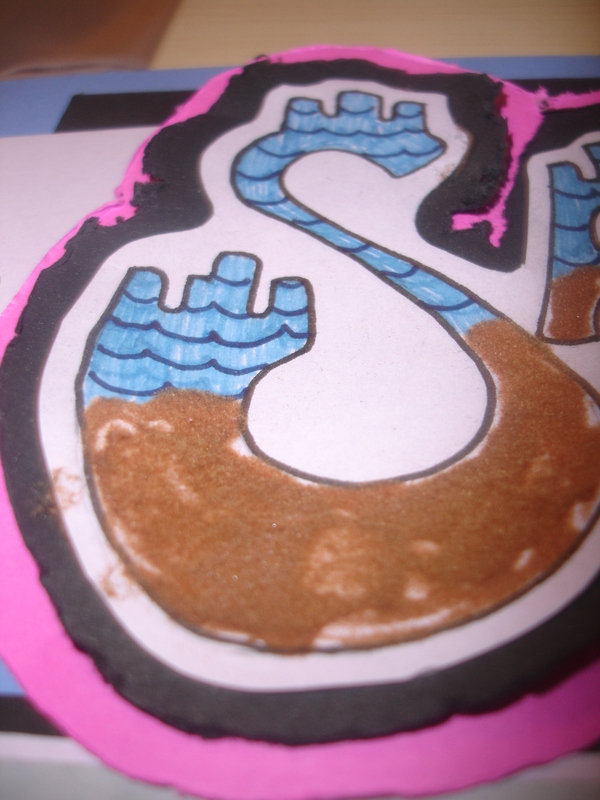 Then taking 2 different blue markers filled the top portion in with the lighter blue and made waves with the darker blue. 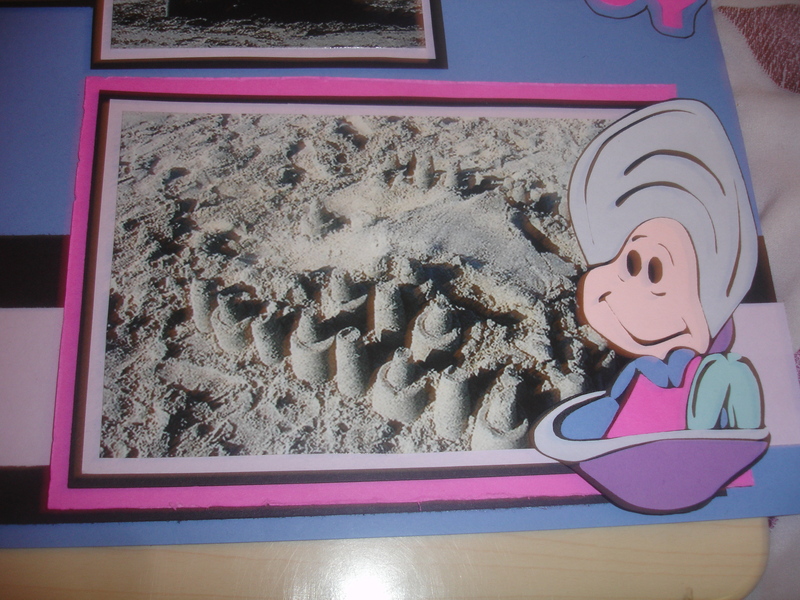 For the bottom I used doodlebugs design inc’s crushed flock, color light brown. To apply the flock. I applied liquid craft glue evenly where I wanted the flock, sprinkled it on top and shook the lose remaining flock onto a spare piece of paper and put back into the bottle. To make the title pop even more I glued the title onto a piece of black card stock and used my Imaginise distresser around the edges. 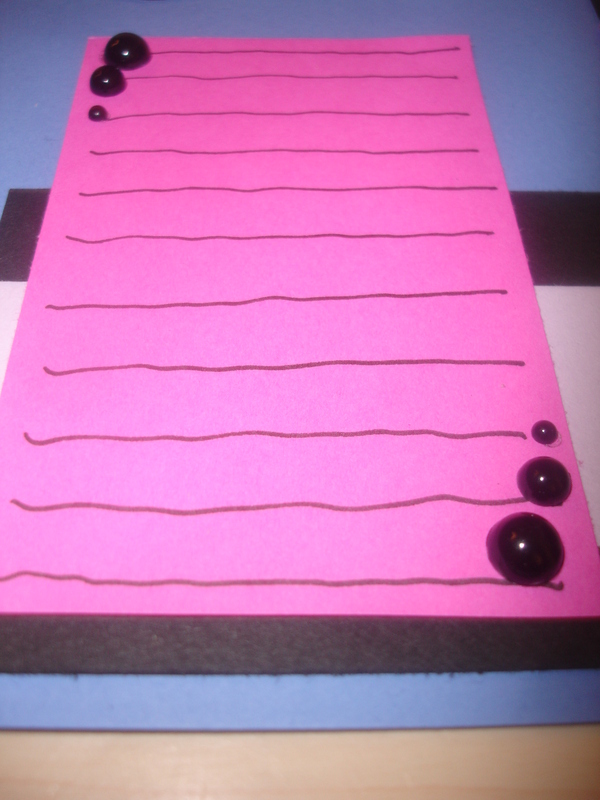 Then I chose to do it again but mounting it to a Fushia piece of paper this time and repeating the process. 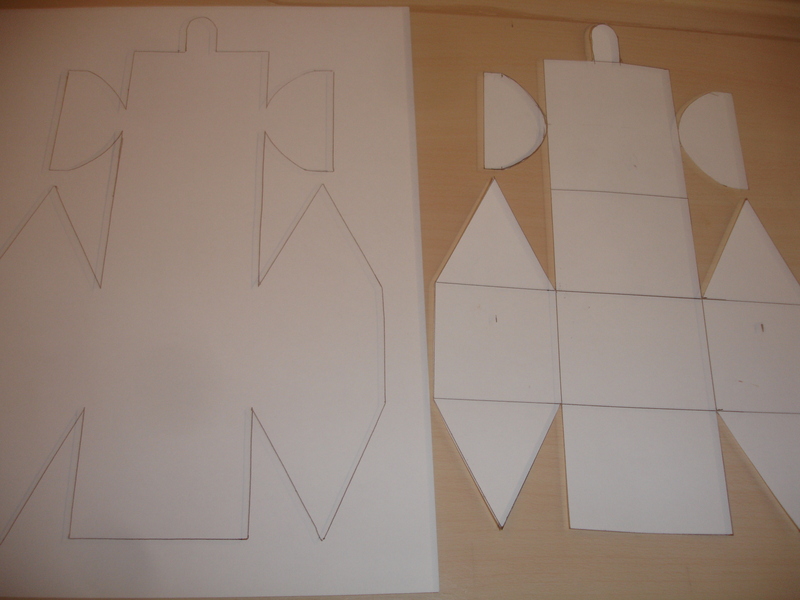 I brought along with me some of my handmade die cuts. 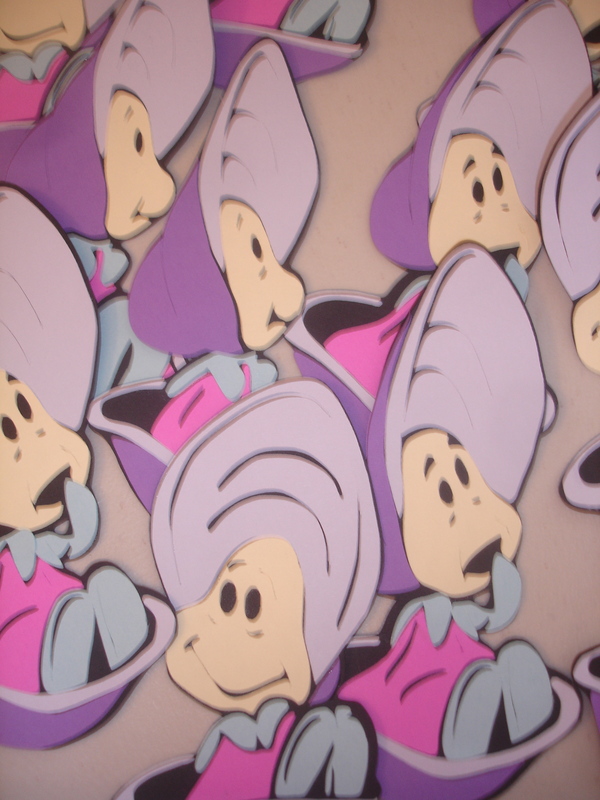 The little oysters from Alice in Wonderland are ones I make and sell on my Etsy site. click here. 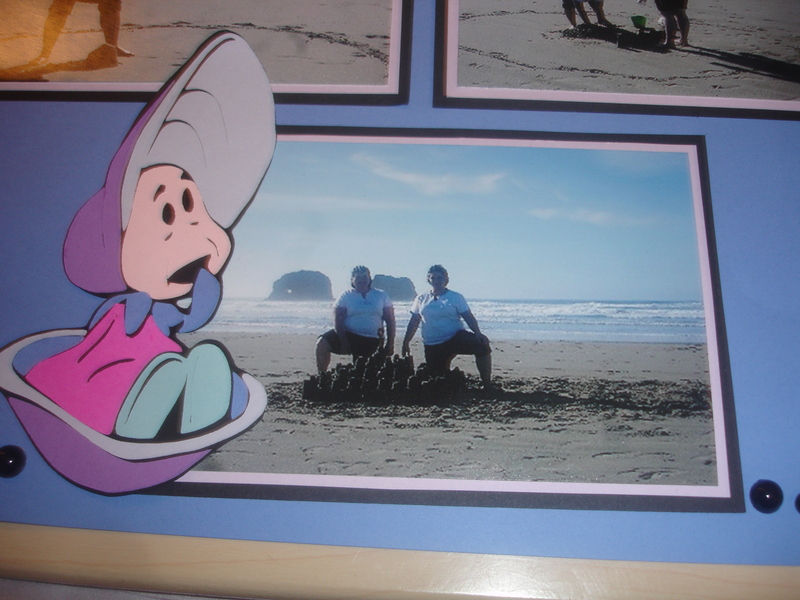 I thought adding these cute little oysters would be perfect for a beach layout. 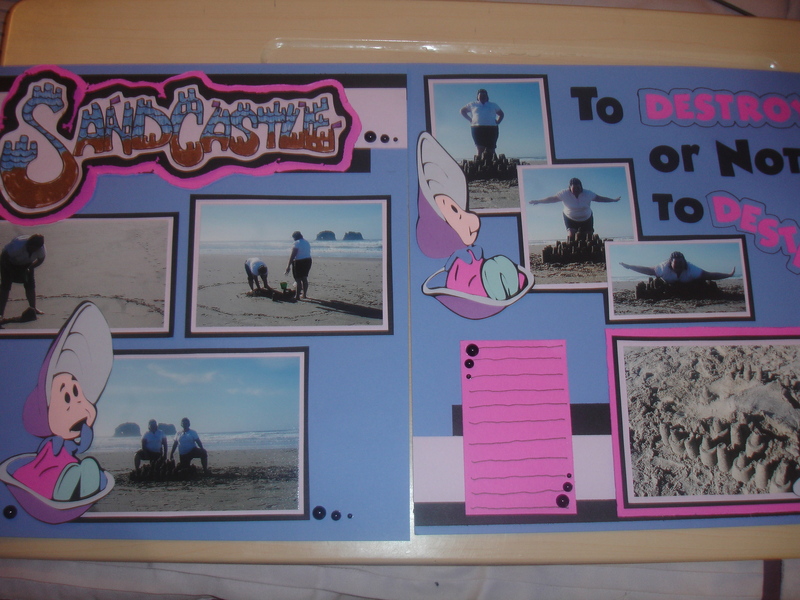 Here are some of the products I used to make this layout. 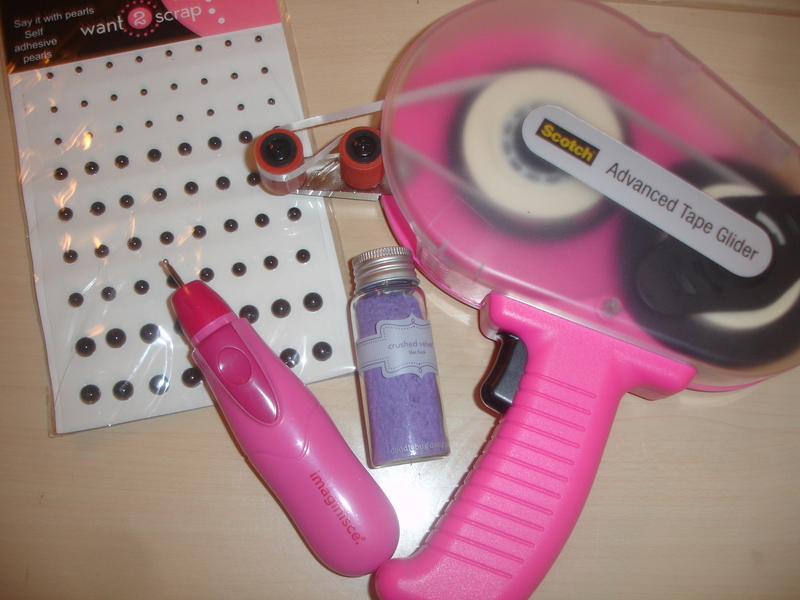 want 2 scrap black pearl bling, Imaginisce Destressor, Doodlebugs Design crushed flock, and my favorite adhesive runner Scotch advanced tape glider. If you have any questions on how I made this page. Please let me know. 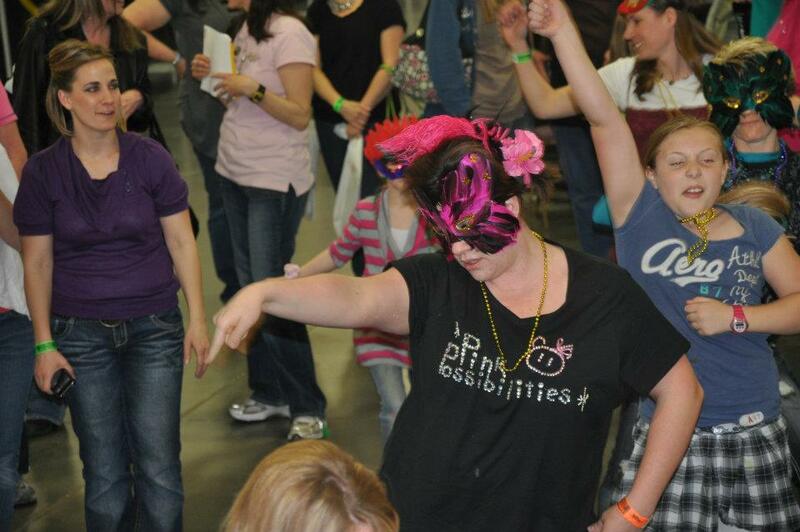 me and my sister were at the scrapbook use expo 2012 all day on saturday. 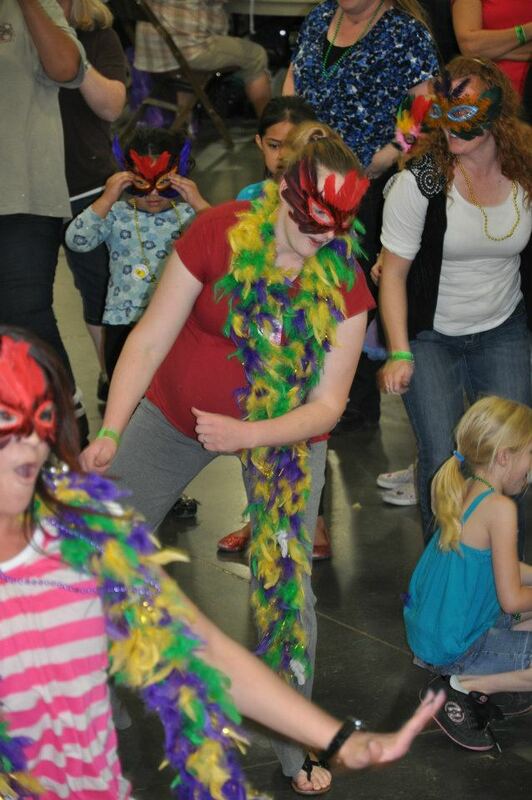 we received many fabulous items, won drawings and participated in extra fun games. we watched a race against time scavenger hunt. where the 2 teams (blue and red) had to go to different vendor stations and find there colored circle and beat the other team back to the dj station before the other team collected all of theres. 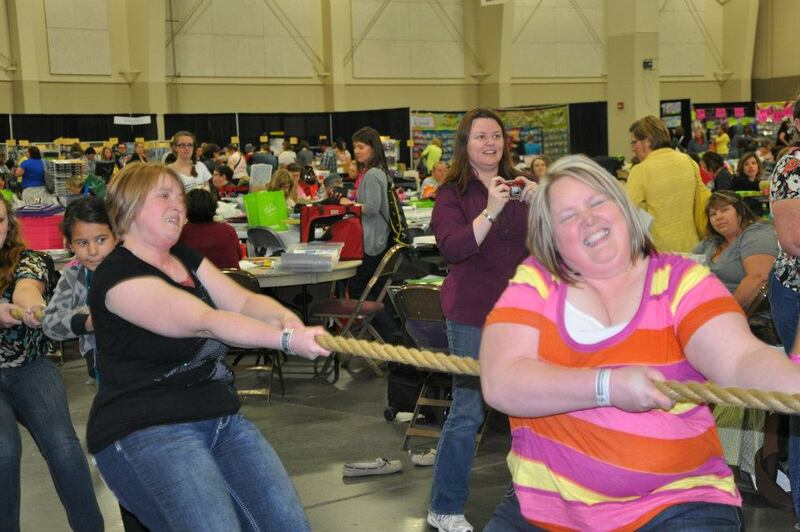 then we had a tug of war. we did get into this one and got our butts handed to us on the 1st pull. congrats to all the woman that won this even after 4 pulls. here are a few shots of the action. 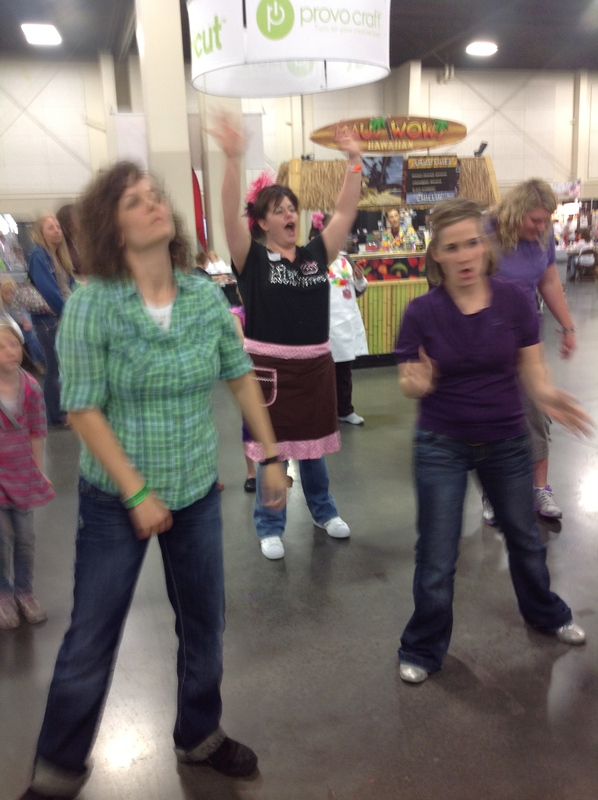 then we had a dance contest. they warmed them all up with a zumba lesson. then each stage to be able to stay in you had to receive an item from one of the floor judges. 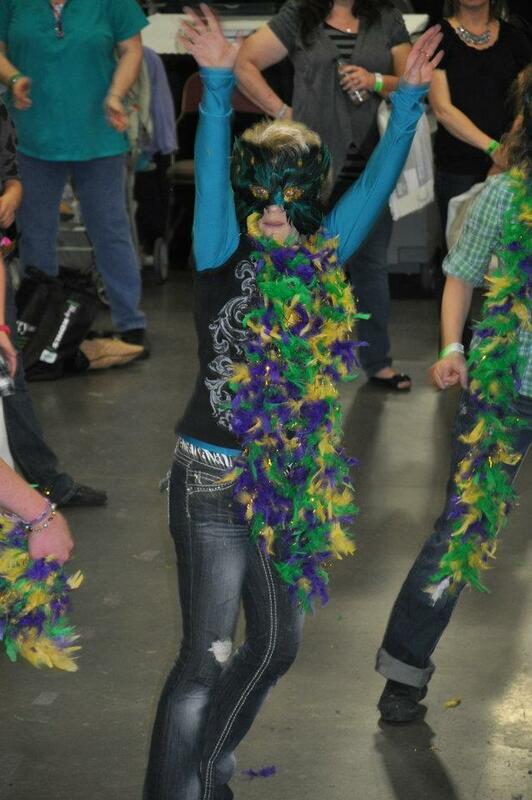 3rd stage – u guessed it a marti gras boa. the final stage they would change up the music every 10 seconds. 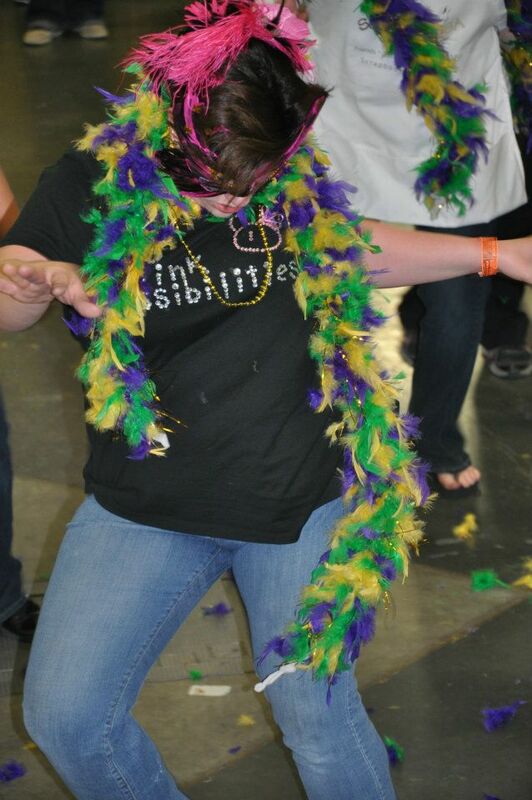 i was so proud of my sister she did the change overs so well. 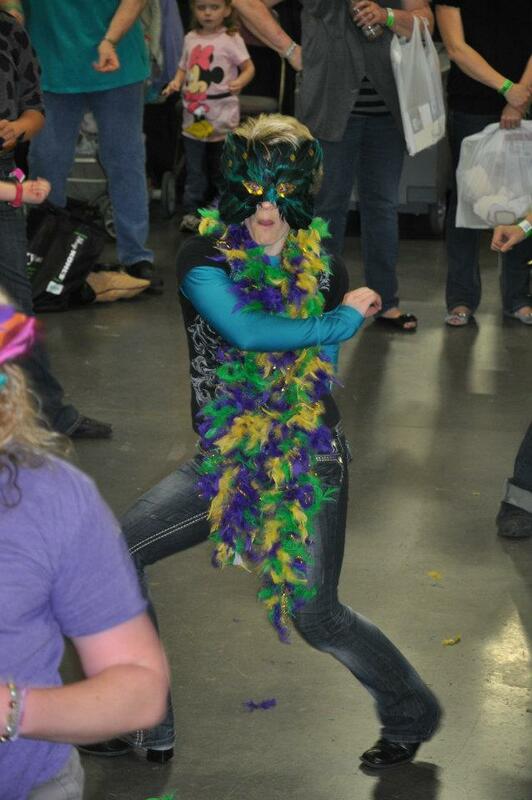 think about going from doing moves from thriller to a country hoe down. Here she is (the 3rd one in pink.. oh course) with the 4 top finalist.